Guren is part of the Ichinose clan, a branch family that turned against the much more powerful magical clan, the Hiragis, hundreds of years ago. However, their inferior status forces them to comply with the Hiragis’ wishes, one of which is to make Guren attend their self-run high school for training magic users. Guren, as the heir to the Ichinose clan, is aware of his uniquely uncomfortable position: he needs to get through high school without catching the attention of the Hiragis. Unfortunately for him, hiding his true power may be more difficult than he realizes as numerous forces begin to shift the status quo in Japan’s underground magical community. 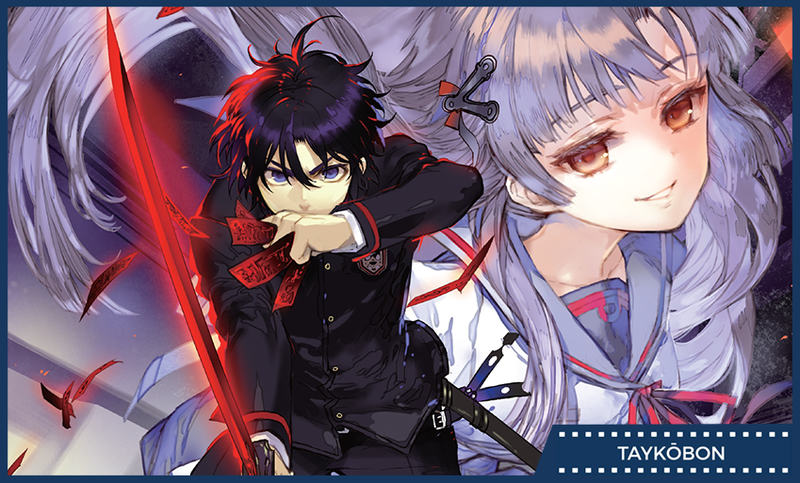 Fans of the Seraph of the End series or magical high school genre regulars will find appeal in this prequel series. Seraph if the End: Guren Ichinose: Catastrophe at Sixteen follows the story of Lieutenant Colonel Guren from the Seraph of the End manga series. I was pleasantly surprised when Vertical, Inc. licensed the books, as Seraph of the End’s manga really lacks in major development for some of the more senior members of the Moon Demon Company. Their backstories and characters are developed much further in this series, which explores the lead up to the Catastrophe through the lens of the then 16 year old Guren Ichinose. Ichinose: Catastrophe is billed as a magical high school light novel series, and in these first two volumes it is definitely what it says it is. As a member of the Ichinose family, Guren is forced to attend the rival (and much more powerful) Hiragi family’s high school, where he is constantly bullied due to his family’s position. What struck me as interesting about this (and what was ultimately the strongest point of the book in my opinion) was the dynamic of the relationship between the Hiragi, Ichinose, and other subordinate clans on either side. In order to avoid unwanted attention, Guren naturally attempts to act weaker than he actually is, a common underdog kind of trope that appears quite often in magical high school series. However, the book doesn’t try to mince words with the reader: Guren is definitely faking his weakness, and the readers are in on the secret along with Guren’s allies. That’s not to say that Guren is even close to the level of members of the Hiragi family, and this discrepancy in ability is what creates the Guren’s inner conflict: the desire to gain more power and overcome his family’s inferior position to the Hiragi. At the same time, the danger of aggressively pursuing such power is made apparent through Guren’s childhood love, Mahiru Hiragi. The classic protagonist power climb is made slightly darker by the immediate indication that pursuing such abnormal power has inevitable consequences. I wouldn’t say that this concept bucks similarly styled trends in other series, but the early nuanced look at the consequences of such power was much appreciated and will hopefully pay off in the long run. As I mentioned before, Ichinose: Catastrophe explores the backgrounds of many characters in the main story. However, the actual characters themselves at this point in this story are for the most part fairly one-dimensional. The overarching plot has a relatively interesting take on the magical high school genre, but the characters it uses are still fairly generic at this point in the story. For example, some of the other classmates. Mito Jujou is a hot-headed tsundere. Norito Goshi is the classic slightly perverted and overly friendly male friend. Additionally, I felt slightly uncomfortable around Guren and his servant Sayuri’s relationship in that her devotion to him goes a bit far and leans on the creepy side without much other development for her otherwise. That’s not to say there is room for improvement in the cast, but the story doesn’t seem to give off vibes that it is particularly interested in exploring beyond Guren and members of the Hiragi family proper. It’s important to note the Ichinose: Catastrophe is billed both as a prequel series to the Seraph of the End manga and as a standalone series. In my opinion, it manages to pull off being both fairly well. For fans of the flagship series, there are plenty of hints towards the future and brief appearances of characters from the main story. For newcomers, there is a story that doesn’t have any prerequisite knowledge needed for enjoyment. For both sides, there’s a slight sense of doom in that the book makes it clear from the beginning that “The Catastrophe” is an inevitable event that will happen regardless of the outcome of the story. Rather than lowering the stakes, knowing of this inevitability instead heightens the state of tension. I wouldn’t call Seraph if the End: Guren Ichinose: Catastrophe at Sixteen some kind of crazy genre deviant, but it manages to be a fairly entertaining take on a magical high school, featuring secret magic societal power struggles an incoming post-apocalyptic future. If that sounds interesting to you or you’re a fan of the anime/manga of the main series, then definitely give the book a shot. However, if you’re more concerned about characterizations and interplay between cast members, then maybe hold off for the time being. At the very least, Vertical’s packaging of two volumes into one book makes for a pretty good bang for your buck. Seraph of the End: Guren Ichinose: Catastrophe at Sixteen was written by Takaya Kagami and translated into English by James Balzer. The first book, consisting of Japanese volumes 1 and 2, was released by Vertical, Inc. on January 26th, 2016. The series is a prequel to the Seraph of the End manga, which spawned two anime seasons that were produced by Wit Studio and aired in 2015.